Quaint, cosy and colourful, the traditional English pub is high on the list of London’s visitor attractions.. Many of them are little bolt-holes, tucked between buildings or sunk below street level, with bow windows of glass as thick as old bottles, low-beamed ceilings and smoke stained walls. Others are grand old establishments, with paneled walls, curtained alcoves or snugs, walls hung with trophies or portraits of eminent figures from history and cavernous fireplaces with crackling fires. There’s usually a certain aroma, peculiar to British pubs, not found in cafes or even in bars – of beer and comfort food; roast beef, Yorkshire pudding and gravy. There’s usually a comfortable, homely ambience too. It is no wonder people try to replicate this ambience by creating their own pubs and bars in storage containers that aim to capture a slice of the London pubs allure. If this is of interest to you then you should visit https://www.conexwest.com/blog/build-living-space-steel-shipping-container-first-steps for more advice. Many young travellers find a home away from home in a London pub, living upstairs and working in the bar or the kitchen and for many locals the pub is the lounge-room. Every pub has its history and its story, often found in its name, like the dark, subterranean Coal Hole on The Strand, Ye Olde Cheddar Cheese and Ye Olde Cocke in Fleet Street, the many Queen’s and Kings Arms and Heads, named for the reigning monarch at the time of construction and then, of course there are those named for some local landmark, like St Stephen’s tavern, in Westminster, named for St Stephen’s Tower at Westminster Palace . 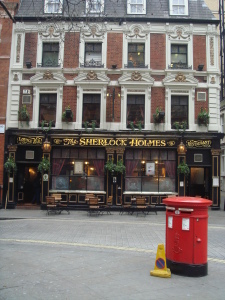 The Sherlock Holmes on Northumberland Street at Craven passage is a classic. It has an ornate Victorian exterior and a dark-timbered, stained-glassed 19th century interior. It is redolent of fine old British fare. Formerly named the Northumberland Arms, it is thought to have been the Northumberland Hotel of the Hound of the Baskervilles. Now, of course it is named for its theme. The downstairs bar is hung with Holmes pictures, pipes and sticks. Upstairs is a replica of Holmes and Watson’s 221 Baker Street sitting room including period furniture, shelves stacked with potions, bottles and books, a violin and a Holmes mannequin. 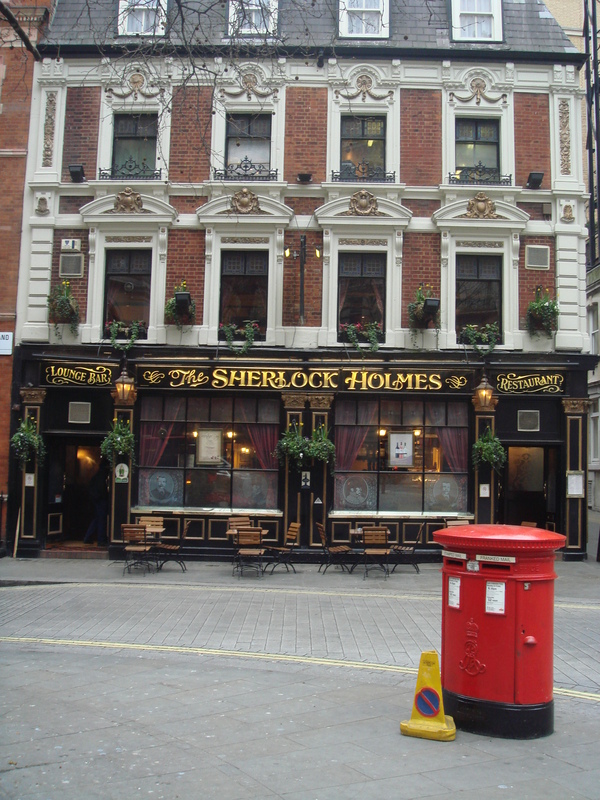 Yet, although this pub is many ways a Sherlock shrine which has its fair share of Holmes pilgrims and tourists, it still has that familiar, comfy, British pub feeling. It has its tables of locals and its completely “at home” handful of young Anzac accented bar staff. There’s great, old English pub on every London block, often more. There’s one for almost every preference and anyone who stays for any length of time will surely find a favourite.